By now we know that the vivo NEX will be released in three versions - NEX, NEX S and NEX A. We know that two of those phones will pack Snapdragon 710 chipsets and there will be one will have the Snapdragon 845 ticking inside. 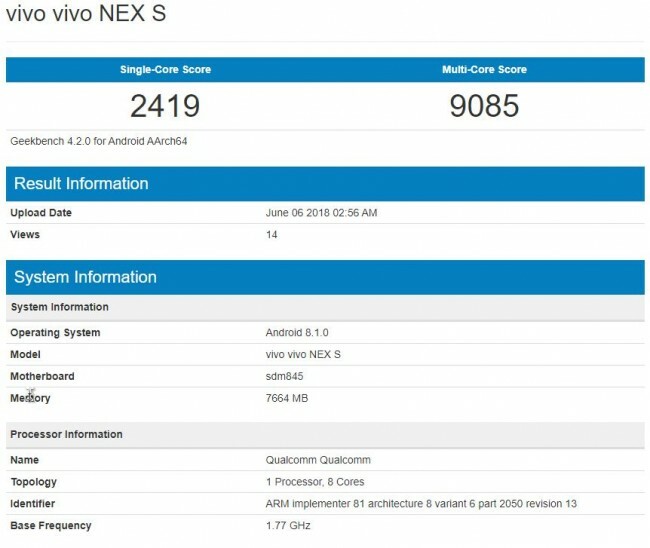 Now we appear to know which one - the vivo NEX S. According to a Geekbench run, the vivo NEX S has a Snapdragon 845 chipset, 8GB of RAM and is running Android 8.1.0. A recent specs leak revealed that the vivo NEX A will have a huge 6.59-inch display of 2316x1080px resolution and a 4,000mAh battery. Another leak suggests than the vivo NEX will have a 6.01-inch screen, 20MP+16MP dual camera and 24MP front camera and a Snapdragon 710. So we can expect the Snapdragon 845--powered vivo NEX S to have the big 6.59-inch display and big 4,000mAh battery. In any rate, vivo will remove all doubt on June 12.